Principal Cast : Zachary Levi, Asher Angel, Mark Strong, Jack Dylan Grazer, Djimon Hounsou, Faithe Herman, Grace Fulton, Ian Chen, Jovan Armand, Marta Milians, Cooper Andrews. Synopsis: We all have a superhero inside us, it just takes a bit of magic to bring it out. In Billy Batson’s case, by shouting out one word – SHAZAM! – this streetwise fourteen-year-old foster kid can turn into the adult superhero Shazam. Warning: Mild spoilers abound. Read on with caution. Off the back of the critical drubbing handed to DC’s Justice League movie, the outlook for its established “extended universe” franchise – consisting of Superman, Wonder Woman, Batman, The Flash, Cyborg and Aquaman – was mired in uncertainty. The studio had failed to engage with audiences the same way the behemoth Marvel Cinematic Universe had done, and many fans lamented the darker, grittier nature of the “Snyderverse” as being ruinous to the sense of fun comic book movies ought to have. In 2018, James Wan’s Aquaman went a long way to salvaging something from Justice League’s wreckage, giving us a balls-out crazy superhero film starring Jason Momoa’s grumbling title character and bring in boffo box-office dollars. The film did away with that dulled, monochromatic style established in Man Of Steel and Batman Vs Superman, and hammered home the fact it was a derivative of comic books with operatic action and a vibrant colour palette that made one’s eyes bleed. 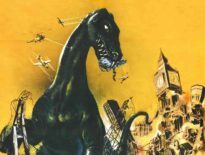 Following up Aquaman with the introduction of modern audiences to the original Captain Marvel – at least before a massive copyright battle back in the 1970’s prevented DC from using that particular nomenclature – otherwise known as Shazam, might have seemed counter-intuitive to established DC franchise world building, but the decision to return to more stand-alone films that worked in and of themselves, appears to have been the correct route. 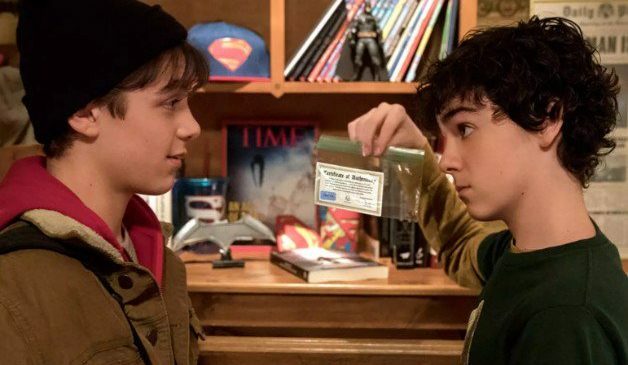 Young Philadelphia street-kid Billy Batson (Asher Angel) is placed into a foster home following yet another failed attempt to locate the mother who abandoned him. There, he meets crippled Freddie Freeman (Jack Dylan Grazer), and the two initially become begrudging buddies. 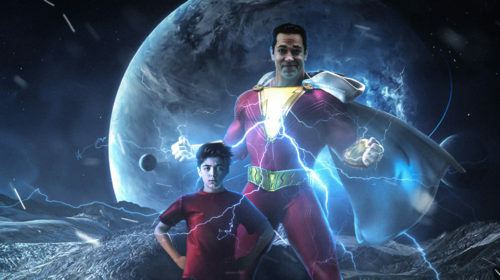 However, when Billy is granted incredible superpowers by an ancient Wizard (Djimon Hounsou), he becomes Shazam (Zachary Levi), the Wizard’s champion in a battle for the world itself. 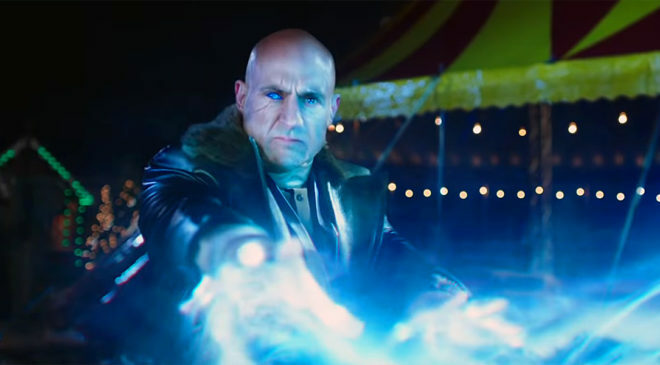 The evil Dr Thaddeus Sivana (Mark Stong), imbued with the powers of the seven deadly sins, hunts the power of Shazam for himself, and will use not just Freddy but Billy’s other foster brothers and sisters to obtain it. There are origin stories, and then there are origin stories. While everyone knows the backstory to Superman, Spider-Man and Batman, there would be far fewer who would have ever heard of Shazam or Billy Batson at all, let alone knowing how they came to be. Injecting pure magic into the DC Extended Universe (are we still using that cumbersome title these days? It’s hard to know…), Lights Out director David F Sandberg brings the bright primary colours of DC’s “Big Red Cheese” to the big screen – not for the first time, however; that honour came about in the 1940’s, not long after the character’s comic book introduction, with Tom Tyler depicting the title role – and to his credit delivers a fun, enthusiastic cinematic experience that widens substantially the relatively obscure DC property into mainstream acceptance. During the character’s formative years, DC went to war with Fawcett Comics over the fact that then-“Captain Marvel” was basically a carbon copy clone of the incredibly popular Superman character, until DC eventually brought Fawcett out and subsumed their IP within the DC Comic Universe at large, rendering the fractious relationship moot. 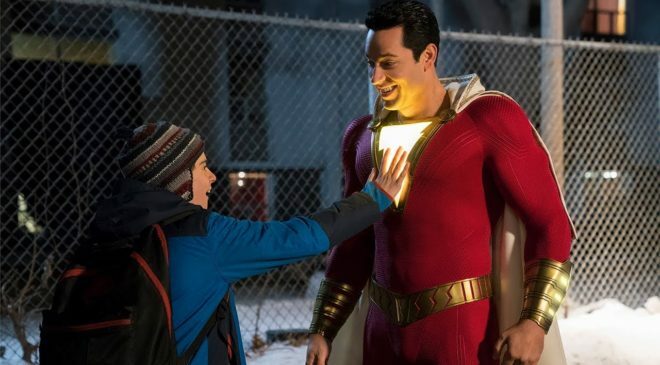 This is all minutiae to an ignorant general modern audience, none of whom would be familiar with Shazam’s publishing history at large; Warner Bros and DC have marketed this film as a comedic wish-fulfilment venture and to a certain degree that’s accurate, although the film proper does contain a lot more depth and darker elements than you might otherwise expect. In saying that, there’s a moment we witness Shazam “flossing”, so the darker aspects are offset by a genuinely modern sense of humour. Shazam has always been about family, with Billy’s role as an orphaned child in foster homes representing the fractured familiarity – loneliness, isolation, a sense of loss – a lot of young kids face even to this day. 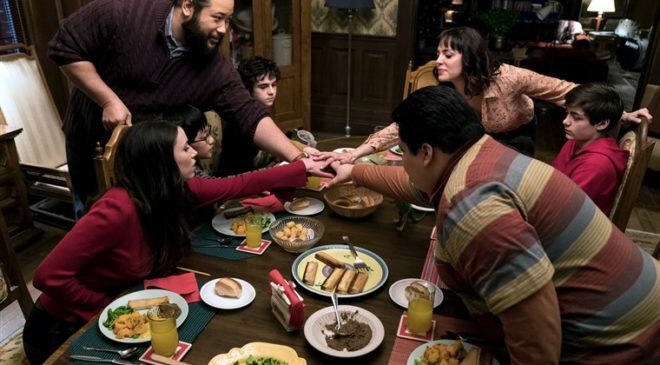 The franchise’s ensemble includes Billy’s comic book cohorts, Freddy (a terrific Jack Glazer), fellow foster kids Mary (Grace Fulton), Darla (Faithe Herman), Eugene (Ian Chen) and Pedro (Jovan Armand) as well as foster mother Rosa (Marta Milans) and Victor Vasquez (Cooper Andrews), while Mark Strong represents the Big Bad in Sivana, in a teeth-clenching cliche all of his own. Familial angst and interpersonal conflict forms a large portion of Shazam’s structure, with Billy and Freddie’s dynamic a significant part of that, while the ancillary characters all get their moment to shine (save one, Pedro, who almost seems to be a silent shadow throughout almost the entire film) in Henry Gayden’s engaging script. Asher Angel’s Billy isn’t shy about being angry over his fortunes prior to becoming Shazam, carving out a sympathetic character we can empathise with on an emotional level, allowing us to invest in the reveal of his newfound powers and their ramifications beyond just being able to lift heavy things. A lot of Shazam has Billy and Freddie testing out the powers of Shazam, working out his limits and abilities with some terrific comedic moments, while offering just the right amount of heart to satisfy even when Billy starts to get a bit cocky. 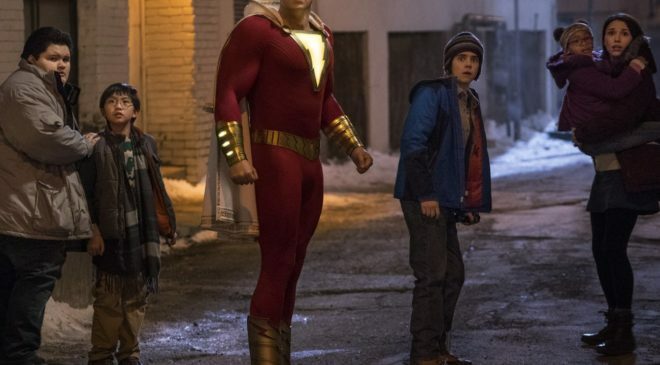 It’s been described elsewhere as Big with superpowers, and that’s really very accurate, but whereas Big never really tackled some of the more adult themes its premise might throw up, Shazam does. And that’s the sign of a mature writer and director understanding the material. As light-hearted as it might seem, the themes beneath Shazam’s surface are tinged with sadness, and the film doesn’t shy from that. An extensive subplot involving Billy’s long-lost mother (Caroline Palmer in a thankless role) isn’t as fulfilling as it needed to be for my personal tastes, but offers just enough emotional resolution to make the rest of the film’s family-oriented complexity work. The film works best when it’s hedging on that “boy in an adult’s body” shtick, and the entire second act deals with that a lot. Billy’s newfangled adult body, essayed by Zachary Levi in a note-perfect performance, becomes the object of social media fandom as well as Billy’s inevitable recalcitrance with the powers he’s been entrusted with, although he’s never outright nasty – as Djimon Hounsou’s gloriously po-faced Wizard exhorts, his Champion is pure of heart and a perfect balance for the demonic Deadly Sins, all seven of whom have inhabited Sivana’s body and given him his evil powers. Mark Strong has played this kind of menace before, to the point it’s almost become a cliche for him, but to his credit he manages to make the character’s lifelong obsession and rage-fuelled mandate a little less stereotype and a lot more edgy realistic. The comic-book roots of Sivana are a godsend for insanity but both Sandberg and Strong parse back the frills and deliver a one-note villain that feels more complex than simple megalomania. There are also a lot of surprises within Shazam that I wasn’t expecting, and that’s thanks to a carefully curated marketing campaign. 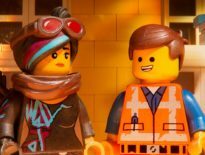 A lot of the trailers and pre-release imagery from the film have withheld some significant storytelling surprises that I would have thought they’d leave out until possible sequels, but the gleeful fanboy in me was happy to witness it, in what has to be a masterfully hidden twist in the tale. The film’s climactic battle sequence does drag a little, containing a number of anti-climactic moments that veer too hard into franchise building, but the sheer fun and enthusiasm by all involved, from cast to director to the entire production, will leave you clapping for more by the end. Also, make sure to stick through the credits for a couple of fun little bite-sized stingers, one of which involves a far more sinister Shazam villain than Sivana. Heh heh. Yes, it’s fun of a kind we haven’t had in a comic book movie in quite some time. Yes, it’s dark at times (and legit scary here and there too, so be aware when taking younger kids into this that there’s some Raiders Of The Lost Ark-level elements within you should consider) but with a carefully balanced plot between gags and complex family issues involving separation, connection and sadness amidst the blustering superheroics, Shazam delivers excellent entertainment at almost every level. The cinematography felt a little muted in my screening, and the fact that the film’s bulging climax occurs at night rather than in daylight makes for a weirdly atmospheric imbalance to the rest of the film, but Benjamin Wallfisch’s engaging score and Sandberg’s cohesive and fast-paced direction make for a really fun time at the movies. 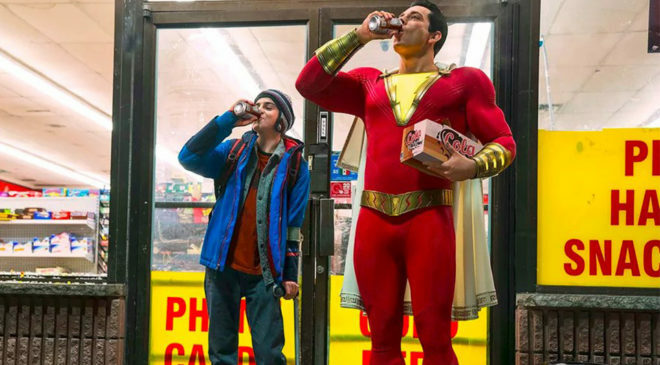 Shazam!, like the lightning that transforms Billy into the title hero, is filled with an infectious energy of childlike wonder and that can move even the most cynical mountains among us. I liked Shazam! but didn’t quite love it like everyone else. 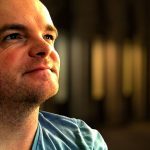 Several things just didn’t work for me. Also felt it had the same problem so many superhero have – giving us a good villain. 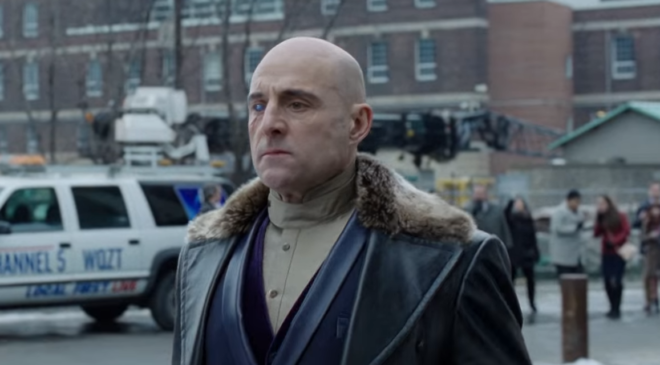 Gotta say I thought Mark Strong did well with a villain whose motives weren’t especially clear (other than paternal revenge of some kind) when it came to Shazam himself – what was he going to do with the Wizard’s powers, and how did he know they’re transfer to him anyway? Otherwise, I did enjoy it.